In 1962 Diamond teamed up with a high school friend, Jack Parker, and released a song called “You Are My Love At Last.” The next year Neil Diamond released his first song under his name titled “At Night” on the Columbia label. The tune failed to get much attention and Columbia didn’t renew their contract with Diamond. By 1966 Neil Diamond struck gold by charting his first singles onto the Billboard Hot 100 with “Solitary Man” peaking at #55 and “Cherry Cherry” climbing to #6. Later that year his song, “I’m A Believer,” was recorded by The Monkees. The tune became the #5 hit of 1967. In Vancouver, Neil Diamond generally had more successful chart runs here in Vancouver, Canada, compared to the Billboard Hot 100. “Solitary Man,” stalled at #55 in the USA but climbed to #12 in Vancouver. “I Got The Feelin’ (Oh No No)” stalled at #16 on the USA, but peaked at #4 in Vancouver. “You Got To Me” was also a #4 hit in Vancouver, but barely made the Top 20 on the Billboard charts, cresting at #18. “Thank The Lord For The Nightime” was #13 in the USA, but went up to #6 in Vancouver. Similarly, “Kentucky Woman” met with a better response in Vancouver as it climbed to #10, but stalled at #22 on the Billboard Hot 100. 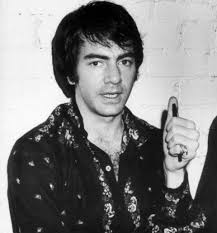 Five of seven charting songs Neil Diamond had on the Vancouver charts did significantly better than in his native America. His first single release in 1968, “Red Red Wine,” followed this familiar pattern, climbing to #7 in contrast to Billboard‘s #62. “Brooklyn Roads” climbed to #13 in Vancouver, but stalled at #58 on the Hot 100. 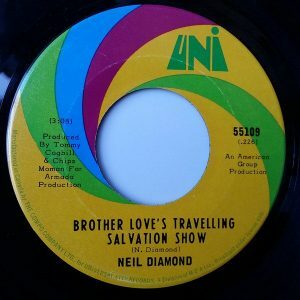 Diamond began 1969 well with a #4 song in Vancouver titled “Brother Love’s Travelling Salvation Show”. “Brother Love’s Travelling Salvation Show” is a song about a tent preacher named Brother Love. He has a ragged tent set up “where there ain’t no trees.” This is a setting for a ministry that is itinerant and caters to the poor. There is a buzz about Brother Love and he walks in with his “eyes black as coal.” Everyone has their attention on Brother Love. Likely, Neil Diamond had in mind a black gospel scene with pentecostal vibes. The audience has a reaction when Brother Love gets really wound up with his gospel message. Nature itself reverberates and “half the valley shakes.” Brother Love has a traveling show in the revival tradition. People come from miles around just to hear him. Worshipping Christians gathering in tents to pray or hear an evangelist give a sermon first occurred in the United States sometime between 1857-1860 in Appalachia. In 2017 the Times Record News of Wichita Falls, Kansas, reported a scene resembling that of “Brother Love’s Travelling Salvation Show”. Reporter Sarah Johnson describes it in these words, “It’s midnight in the middle of summer. It’s so hot and sticky, people on either side of you are doing their best to dry their sweat-streaked faces with homemade fans. Hundreds of people are packed shoulder to shoulder under a large tent in the middle of a field, while their feet kick up the sawdust on the floor. The traveling evangelist has been preaching for five hours now and shows no signs of stopping.” First Baptist Church of Forney, Texas, hosted a revival for four days in May 2017. Lakeside City, an unincorporated town in southern Kansas was also holding a tent revival that summer. “Brother Love’s Travelling Salvation Show” climbed to #2 in Seattle, Memphis, Toledo (OH) and Indianapolis, #3 in Los Angeles and Minneapolis/St. Paul, #4 in Detroit, Winnipeg and Toronto, #6 in Arlington (VA) and Tucson, and #7 in Chicago, Louisville and Hartford (CT). As it got next to no airplay in over half the states in the USA, the song stalled at #22 on the Billboard Hot 100. Neil Diamond had many million sellers. These include “Sweet Caroline,” a song about his wife at the time named Marsha. Diamond decided not to call the song ‘Sweet Marsha.’ “Holly Holy,” “Cracklin’ Rosie” and “Song Sung Blue” are among his other smash hits. The latter two were both number one hits on the Billboard Hot 100. Between 1966 and 1977 Neil Diamond charted 19 songs into the Top Ten in Vancouver and 8 songs into the Top Ten on the Billboard Hot 100. Some, like “Done Too Soon“, had a much better chart run in Vancouver then in the USA. His last #1 hit was a duet with Barbra Streisand titled “You Don’t Bring Me Flowers Anymore” in December 1978. Diamond had several major hits on the pop charts into the early 1980s, including “America,” a song with a very positive interpretation of the history of immigration to the United States. Diamond later told a Jon Bream in his book Neil Diamond Is Forever: The Man And His Music, “America” was the story of my grandparents. It’s my gift to them, and it’s very real for me … In a way, it speaks to the immigrant in all of us.” The song became the theme song for the 1988 campaign of Democratic presidential candidate, Michael Dukakis. Boss 30, CKLG 730 AM, Vancouver, BC, May 9, 1969. Neil Diamond biography, Jewish Virtual Library. Daniel Keeps, “Neil Diamond Retires From Touring After Parkinson’s Disease Diagnosis,” Rolling Stone, January 23, 2018. Dianne Severance, Ph.D., “When Revival Ran Epidemic,” Christianity.com, April 28, 2010. Sarah Johnson, “Give Me That Old-time Religion,” Times Record News, Wichita Falls, Kansas, May 8, 2017. 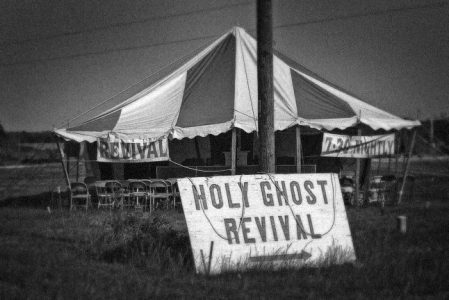 “Old-fashioned Tent Revivals Still Alive after 200 Years,” Wilson Times, Wilson, NC, April 20, 2018.